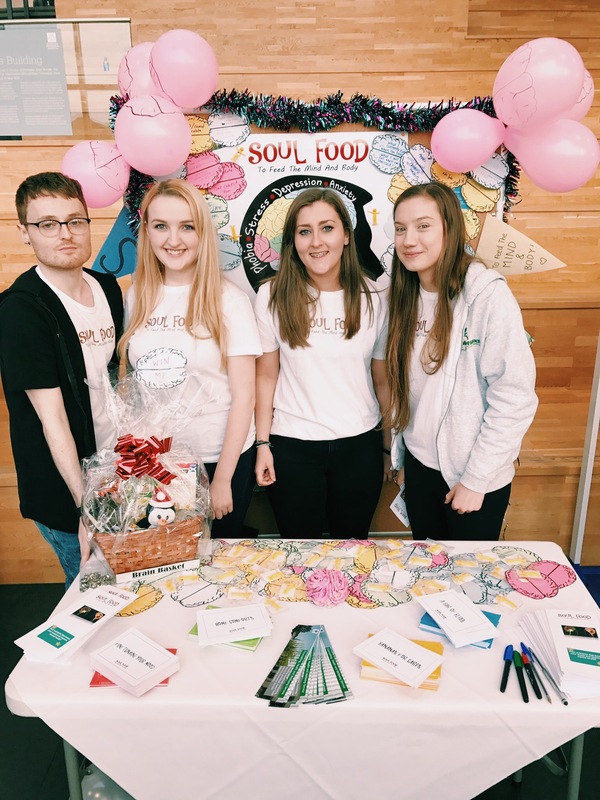 For a module of my degree, it is required as a team, to put on a health fair and run a stall promoting the importance of nutrition and health. As a topic myself and my friends are very passionate about, we chose to discuss mental health. In the UK, 1 in 6 people suffer from a common mental disorder, including depression, anxiety and schizophrenia. Suicide is rapidly becoming one of the major causes of death, with 6581 people committing suicide in the UK alone in 2014. All of these deaths could have been avoiding with the appropriate support and help. Mental health problems amongst university students is becoming an ever-growing problem. Stress can be the cause of, or a result of mental health problems. As a student, studying can be really stressful, and for many is the first time they are living independently. Having to learn about financing, budgeting, networking and meeting a whole new world of people can sometimes be overwhelming and often a lonely experience. There is a positive correlation of evidence between academic stress and locus of control, which in turn can lead to poor mental health and low self esteem. Students often use coping solutions such as comfort eating, binge drinking and substance abuse, which can be masked by the social norm when joining university. However, in the long term, these can have a much more detrimental effect on health. Not only can mental health problems develop, but diseases such as obesity, cardiovascular disease and premature death. Luckily, there are many association between nutrition and mental health. An amino acid called tryptophan, found in many foods such as eggs, nuts, bananas and even turkey (winning at Christmas!) has been found to have a positive effect on the synthesis of brain serotonin, also known as the “happy hormone”. Omega 3s for brain development and vitamin B12, found in meats and fish, are also found to be influential to brain health, development and improved cognition. We know mental health is just as important as physical health, but despite the reduce, there is still a terrible stigma with mental illness. 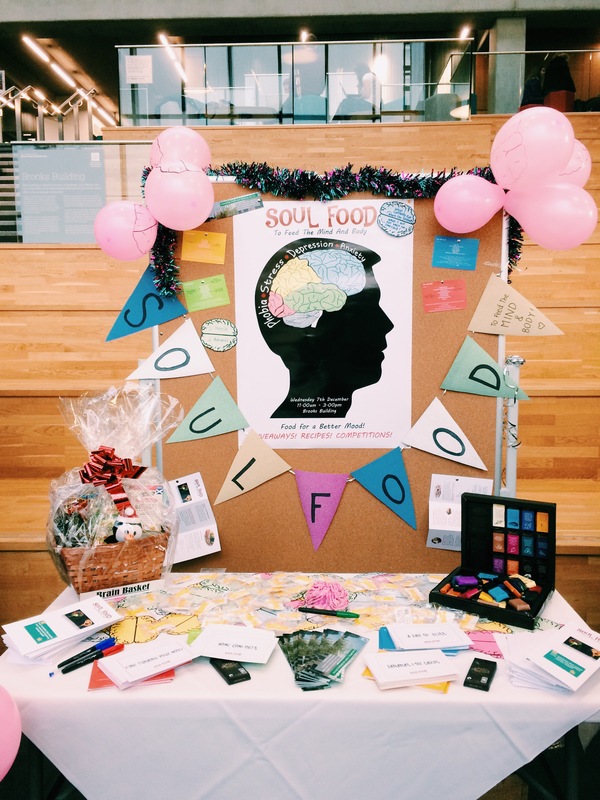 As a stall, we did not only want to allow visitors to feel completely comfortable about talking around the subject and any negative feelings they might be having, but we provided information and support on helpful lifestyle tips and eating habits they could try. 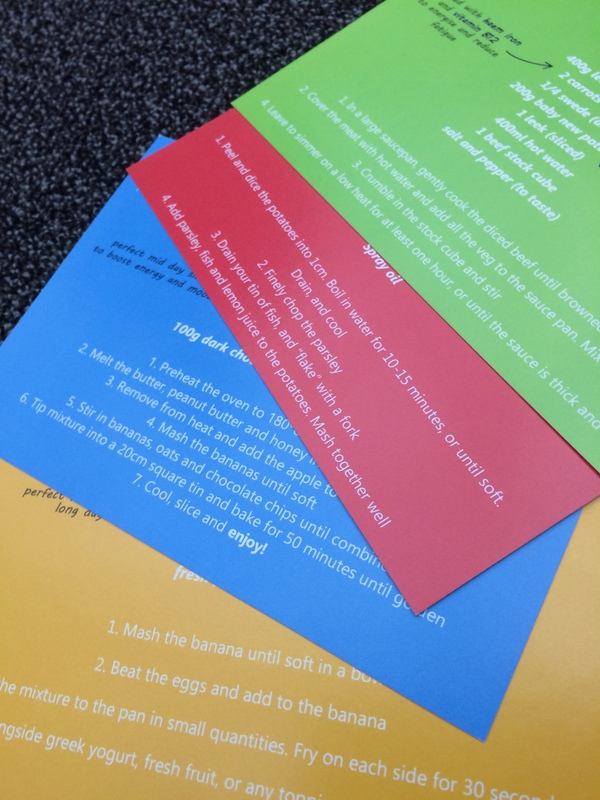 I compromised four simple, student friendly recipe cards which all contained foods which were linked to the nutrients known to have positive effects on mood: fish cakes, peanut butter bars, beef stew and banana pancakes. We also encouraged people to write down their “naughty” and “unhealthy” comfort foods and write down a healthy swap they were going to try make in times of need, such as crisps for a banana, fried chicken for a tuna sandwich or even milk chocolate for dark chocolate.